Count I is a favorite of the federal government. It is the all inclusive, ominous “Conspiracy” charge. Corrine Brown is charged with conspiracy to commit mail fraud and wire fraud. Basically, conspiracy is the agreement between at least two people to commit a crime. It doesn’t even have to be a explicit agreement. It can be implicit. In other words, if two people agree to sell cocaine, they don’t have to specifically say that they are going to sell the cocaine. They don’t have to work out all of the details. They don’t have to say anything at all. The conspiracy can be proven by their actions and the surrounding circumstances. The government simply must prove that two or more people agreed in some way to commit the crime and that the Defendant knew the unlawful purpose of the plan and joined in it. 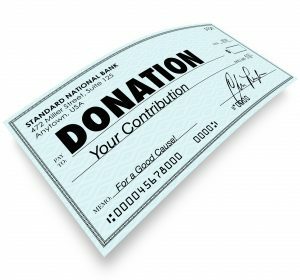 So, if the government proves that Corrine Brown knew that One Door for Education was taking in contributions by telling people that the money was going to scholarships, but she agreed, either implicitly or explicitly, to allow someone to put that money in her bank account for her own personal use, the jury would find her guilty of this conspiracy charge. Even if the money never made it to her bank account. It is the agreement that is the conspiracy, not the actions. But for practical purposes, the government usually charges people with conspiracy, as well as the underlying charge, when the underlying charge has been completed. This is the case in Corrine Brown’s prosecution. She is alleged to have conspired to commit mail and wire fraud, and she is charged with actually committing mail and wire fraud. Count 20 relates to Elias Simmons only. In Count 19, Corrine Brown is charged with knowingly concealing the alleged fraud relating to the One Door for Education Scholarship Fund by failing to report on her financial disclosure form required of all congressmen and congresswomen the money she received from One Door for Education as income. Members of Congress must fill out and file a financial disclosure form outlining their financial transactions and it is a crime to falsify or conceal financial information when filing that form. Count 21 is a distinct and separate crime from Count 19. Count 19 related to filing a financial disclosure form as a representative of government. Count 21 relates to impeding the administration of the internal revenue laws, or tax obstruction. Basically, the government has accused Corrine Brown of failing to include the money she received from One Door for Education on her taxes. The government also alleges that Corrine Brown claimed deductions for charitable donations that she didn’t actually make. Corrine Brown is accused of filing false tax returns. Specifically, she is accused of failing to report the money she received from One Door for Education and for claiming charitable contributions that were not made. Counts 22 – 24 are also distinct and separate crimes from Counts 19 and 21. 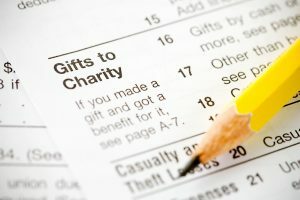 Counts 22 – 24 relate to the actual filing of her tax return which she allegedly knew contained false information, specifically the claimed donations that were not made and the income from One Door for Education that were not reported in the tax return. Count 22 relates to filing a false tax return in the year 2013 for the year 2012. Count 23 relates to filing a false tax return in the year 2014 for the year 2013. Count 24 relates to filing a false tax return in year year 2015 for the year 2014. Corrine Brown’s case highlights the fact that there are many statutes that can be applied to one set of actions. For example, if Ms. Brown was alleged to have only solicited one check into the One Door for Education Scholarship Fund under false pretenses which was mailed after an email solicitation and if she failed to disclose her proceeds from that one check, the government would have charged her with Conspiracy, Mail Fraud, Wire Fraud, Scheme to Conceal Material Facts and Filing False Tax Return. You may think that this is double jeopardy, but it isn’t. Each count relates to a different act as explained above. Each crime has a different element. 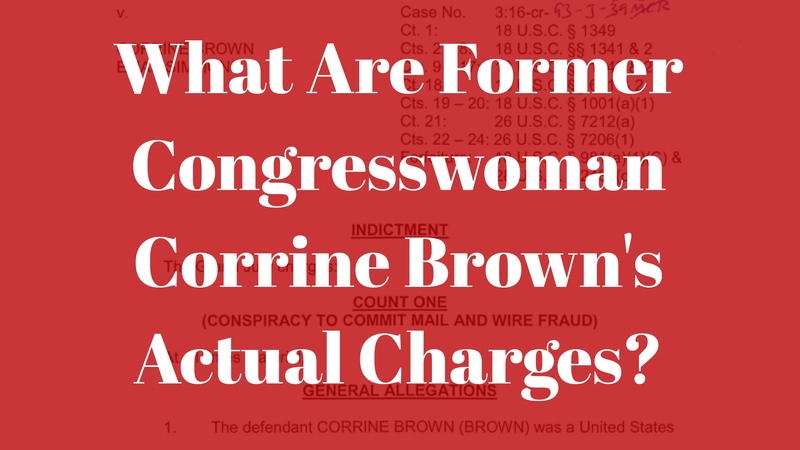 If you would like to read the Corrine Brown indictment, click here.